This is my 2nd custom scenario for game Age of Empires 3, a RTS game created by Ensemble Studio. Age of Empires 3 is very popular RTS (real time strategy) game that first debut in the '90 and then the third version release in 2005. The game have been released with two Expansion Packs. The first expansion pack is The Warchiefs. 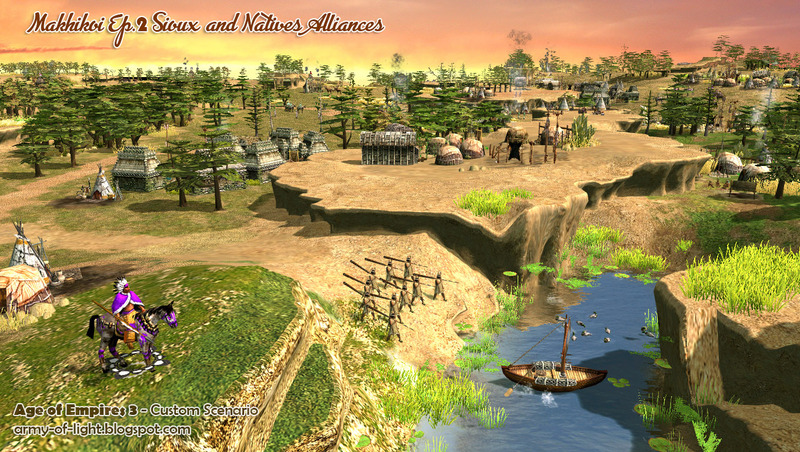 In this expansion pack, there are new Native American Tribes minor civilization. In total, there are 19 Native American Tribes settlements where we can access via custom scenario editor. In this custom scenario, I have put all 19 Native Tribes settlement so we can play them all in one single scenario. 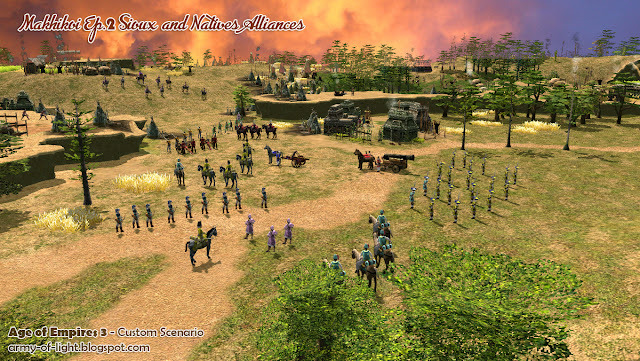 If you haven't play the firs scenario, download it HERE - Makhikoi Episode 1 - Nineteen Tribes. 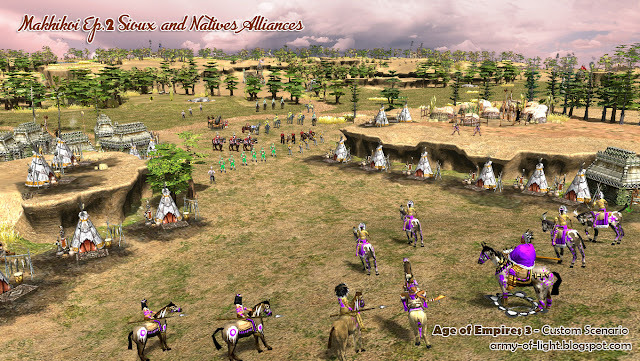 In this second scenario, Makhikoi will be on Sioux side. In this land, all nineteen Native American Tribes are present. With the help of the Nineteen Tribes' units and technologies, The Sioux will grow into super power in the end. 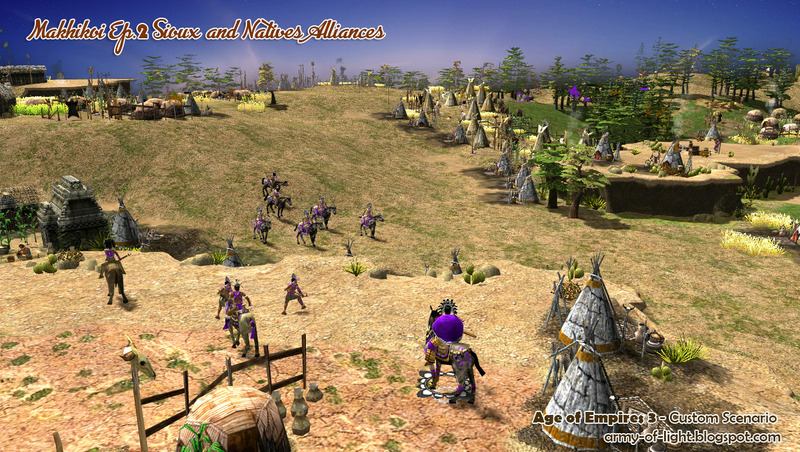 Makhikoi and the Sioux will challenge seven European enemies. The main goal in this custom scenario is to enjoy the NAT units. This scenario has been designed to motivated player 1 to build all 19 trading post / settlements. When you build trading post , you'll received various rewards. 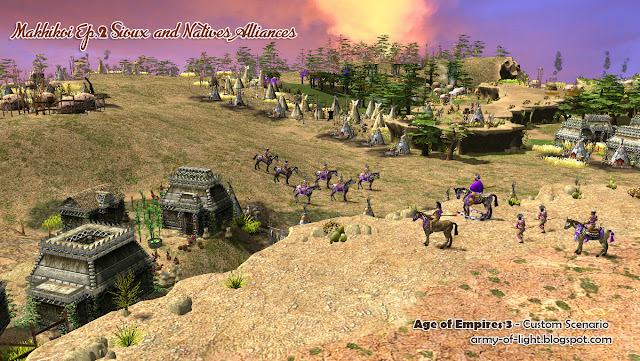 - Copy attached file "HomecityX_Makhikoi2.xml" to folder "..\Age of Empires III - Complete Collection\bin\Campaign\War Chief". This is default folder that contained all homecity for Warchief Expansion Campaign. This folder location can be varied depends on where you install your Age of Empires III files. Warning , if you failed to copy my intended files into that folder, your home city deck will be nulled. - You can set up your own home cities by copying the whole text in your Sioux Home City (in Savegame\sp_Hunkpapa_homecity.xml) and copied it into that HomecityX_Makhikoi2.xml files. Just learn the tag and set it up. The enemies had been located based on their capabilities in handling rush. You should rush majority of them. The strongest enemies are the furthest in the north and we need to face them in full power. Everytime you build Native Trade Post, you'll received their necessery technologies. In the end, the Sioux will be super power due to this features. 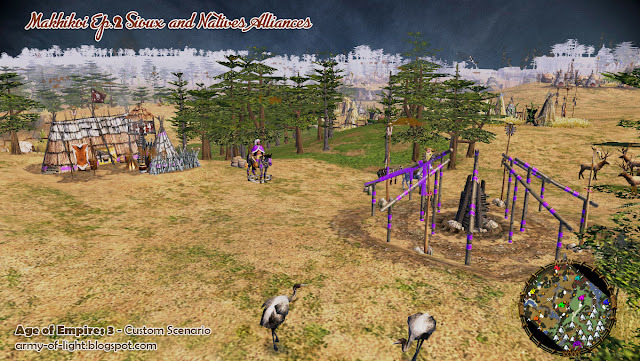 Everytime you build Native Trade Post, the surrounding Teepees will be converted as yours. This is to compensated the lack of wall in Sioux civilization. Do protect these Teepees because if you lost them you will gradually weakeaned. There are two enemies that will granted you 10 Native Villagers + Travois Farm if you defeat them, keep an eye on them. This scenario (and the other scenarios I created) use a group object. These group object named as eg. "cherokee native village.xml" and others. 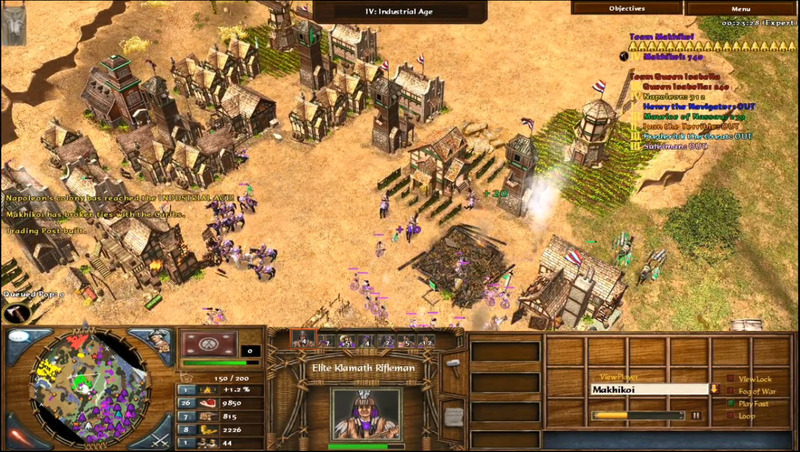 These files must be present in folder "..\Age of Empires III - Complete Collection\bin\RM2\groupings". In case you didn't have this, you can download it from HERE. Put the files in that folder. - Choose your enemies wisely and rush them early. You can only survive this scenario if you success killing at least three enemies in the first 15 minutes.